Baptisms of Grewelthorpe residents. 1653-1706. People born in Grewelthorpe living elsewhere in 1891. Information about Thompson’s of Grewelthorpe and district. If you have information for this page please contact me. The following information has been taken from Census records, school records and Parish registers and newspapers. Thanks also to Ann Simpson [nee Goundry] for information. AMY ELIZA THOMPSON [nee TIPLING.] Born 26 June 1897. Buried 1.6.1975 Grewelthorpe. M.I. Wife of Thomas. see wedding report at end. Living Kirkby Malzeard in 1939. ANN THOMPSON. Born C. 1760. Buried 24.3.1849 Kirkby Malzeard. Age 89. [Ref.Par.Reg.]. ARTHUR THOMPSON. Born 11 Aug.1882. Unmarried. A horseman living Swinton Cottages in 1939. CHRISTOPHER THOMPSON. Born C. 1837 Winksley. Brother of Edward. Lived Leppington in 1871. CLARENCE G. THOMPSON. Born 4 Oct 1923. Son of George & Alice of Crabb Hse. Healey. Horseman on farm. in 1939. DOUGLAS THOMPSON. Born 6.2.1927. Started Grewelthorpe school on 7.12.1931. Left for Ripon Modern school 1939. EDWARD THOMPSON. Born C. 1827. Winksley. Husband of Mary Hanley. of Grewelthorpe. Banns read in April 1858. In 1861 they lived with Mary’s parents Thomas & Susannah Hanley. Butchers in Grewelthorpe. Edward was a Gamekeeper. In 1871 they lived Leppington Yks. then they lived in Kirkby Malzeard in 1881 & 1891.Report in Northern Echo 11 March 1885. At Bedale yesterday, Edward Thompson and George Barker labourers, of Kirkby Malzeard, were charged with game trespassing at Swinton. Mr Edmundson prosecuted, defendants were seen by Henry Allison going towards a place called Crow Wood. He watched them, and saw Barker drive the wood and rise some pheasants. Thompson fired two shots at them. Defendants were fined or £3 Os .3d each, including costs. ELEANOR M. THOMPSON [nee?] Born 24 Aug. 1912. Living Kirkby Malzeard with George & Lily Blackburn in 1939. ELIZA THOMPSON. Born 5.1.1895. Bap 31.3.1912. Grewelthorpe. Dau of William & Elizabeth. Started Grewelthorpe school 6.5.1901.Married ARTHUR CECIL COOKSHAW. a joiner at Crown Hotel, Grewelthorpe. on 24.6.1919. ELIZABETH THOMPSON. Born 14 March 1867 West Aukland. Buried 2.4.1953 Grewelthorpe M.I. Wife of William of Bush Farm. In 1939 a widow living Burn Brae Grewelthorpe. ELIZABETH THOMPSON. Dau of T. Thompson of Thorneycroft Grewelthorpe engaged to Peter Drewery of Ure Bank Terrace Ripon. December 1953. Ref. Yorkshire Post. GEORGE THOMPSON. Born C1834 son of George. He was a Gentleman’s servant from Barton le Street. Married on 20.1.1868 at Kirkby Malzeard church to Margaret Ward. [b.1832] dau of Antony Ward. Blacksmith of Azerley. GEORGE THOMPSON. Born 19 Sept 1884. Unmarried. Horseman living Swinton Cot tages Ellingstring in 1939. GEORGE THOMPSON. Born 18 Jan 1884. An estate worker living unmarried in Ellingstring in 1939. Possibly son of Jane [born 1852]. GEORGE THOMPSON. Born 19 Feb. 1885. Married to Alice [born 1891]. Sheep & Dairy farmer living Crabb Hse. Healey in 1939. GEORGE KENNETH THOMPSON. Born 31.10.1938. Son of John [Jack] & Freda of Oak House. Started Grewelthorpe school 21.5.1947. Left in 1950. GILLIAN MARGARET ELIZABETH THOMPSON. Born C1930. Buried Mickley 20.7.1982. From Sutton Howgrave. HANNAH GERTRUDE THOMPSON. Bap. 22.9.1889 Mickley. Dau of John the retired manufacturer & Catherine. Lived The Lodge Mickley. HANNAH THOMPSON. Born 15.9.1891 Hauxwell. Died 1973. Dau of William & Elizabeth. Started school in Mickley. Then to Grewelthorpe school on 21.8.1899. Left in 1905. Living Bush Farm with parents in 1911. Married JOHN WRIGHT GOUNDRY. of Galphay. [Born 1893 died 1938.] Lived Bellwood Farm, Grewelthorpe. HENRY THOMPSON. Born 8.5.1913. Son of Joseph Banner farmer at Bramley Grange. Came from Northalleton to Grewelthorpe school on 8.2.1926. left 12.3.1926. HERBERT THOMPSON. Born 28.3.1912. Son of Joseph Banner farmer at Bramley Grange. Came from Northallerton to Grewelthorpe school on 8.2.1926. Left 12.3.1926. HILDA M.THOMPSON. Born 22 July 1916. Dau of George & Alice of Crabb Hse. Healey. Married ? Furby. JAMES WITHAM THOMPSON. Bap. 21.9.1892 Mickley. Son of John the retired manufacturer & Catherine. Lived The Lodge Mickley. JAMES E. THOMPSON. Born 11 Jan.1917. Son of Thomas & Mary of Bales Farm. Healey. JANE THOMPSON. Bap. 31.12.1786. Grewelthorpe. Dau of James of Thorpe Moor. JANE THOMPSON [nee ?]. Born 15 Aug. 1852. Living Swinton Cottages in 1939 with 2 sons George & Arthur. JANE THOMPSON. Born C. 1881. Ilton. Dau of William & Elizabeth. JANE THOMPSON. Bap. 31.12.1882 Grewelthorpe. Dau of William & Mary Ann of Bramley Grange. JOHN THOMPSON. held land at Nutwith, Low Moor, Grewelthorpe in the 1782 Enclosure awards. JOHN THOMPSON. Bap 22.10.1783 Grewelthorpe. Son of John. JOHN THOMPSON. Born 14 March. 1877 Blind from birth. Unmarried. Living with George & Alice of Crabb Hse. 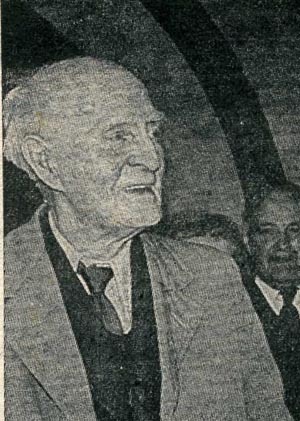 Healey in 1939. JOHN [JACK] THOMPSON. Born 2.5.1907. Bap 31.3.1912 Grewelthorpe.Buried 2.4.1981 Grewelthorpe M.I. Son of William & Elizabeth. Started Grewelthorpe school 1.4.1914. Left for Ripon Grammar school 1921. Married Freda Ripley. Lived Oak House Grewelthorpe. JOHN T. THOMPSON. Born 13 Feb.1913. Son of George & Alice of Crabb Hse Healey. JOHN WILLIAM THOMPSON. Died age 42yrs. Grewelthorpe. KATE THOMPSON. Bap. 31.5.1885 Mickley. Dau of John a retired manufacturer & Catherine. Lived The Lodge, Mickley. LILY THOMPSON. Born 10.3.1888 Hauxwell. Dau of William & Elizabeth. Married JOHN LODGE. Started school in Mickley then went to Grewelthorpe school 21.8.1899. Left in 1903. Living at Bush Farm with parents in 1911. unmarried. MARIA THOMPSON. Born 5 Aug. 1878. A nurse. Living Fairfield Kirkby Malzeard in 1939. Unmarried. MARY THOMPSON. Bap 26.2.1779 Grewelthorpe. Dau of James of Allershaw. MARY THOMPSON. Born C.1803. Buried 21.11.1865 Grewelthorpe. M.I. Lived Camp Cottage. MARY ANN THOMPSON. Born C. 1832 Grewelthorpe. Servant for Thomas Barker for many years. MARY THOMPSON. Born C.1855 Grewelthorpe. Widow in 1901 living Lofthouse, Fountains Earth. MARY ANN THOMPSON [nee ?]. Born C 1861. Hauxwell. Buried 29.4.1886 Grewelthorpe. Married William had a daughter Jane Bap. 31.12.1882. MARY THOMPSON. Born 28.7.1902. Dau of William & Elizabeth of Bush Farm Grewelthorpe. Started Grewelthorpe school 4.4.1910. Left age 14yrs. Married HARRY KITCHEN. a policeman on 17 Feb 1953. Lived at Burn Brae Grewelthorpe for a time. see photo at end. PETER THOMPSON. Born 19.6.1934 son of Cyril Thompson of Kirkby Malzeard. Started Grewelthorpe school 13.11.1939. left to go to New Park School Harrogate in 1940. Came back to Grewelthorpe 25.8.1941 then moved to Kirkby Malzeard 5.12.1941. ROBERT THOMPSON. Born C1818 Grinton. Married to Mary of Carlton. Game watcher living Ilton in 1871. ROBERT THOMPSON. Born 18.4.1899. Hauxwell. Bap. 31.10.1899 Grewelthorpe. Son of William & Elizabeth. Started Grewelthorpe school 28.8.1899. Left 1903. Living at Bush Farm with parents in 1911. unmarried. SARAH WITHAM THOMPSON. Bap. 17.7.1887 Mickley. Dau of John the retired manufacturer & Catherine. Lived The Lodge, Mickley. THOMAS C. THOMPSON. Born 18 July 1882. Married to Mary [born 1885]. Sheep & Dairy farmer at Bales Farm Healey in 1939. THOMAS THOMPSON. Born 2.6.1890 Hauxwell. Buried 15.9.1930 Grewelthorpe M.I. Son of William & Elizabeth. Started Grewelthorpe school 28.8.1899. Left 1905. 1911. Living Bush Farm with parents. Husband of AMY ELIZA TIPLING. See wedding report at end. THOMAS ARTHUR THOMPSON. Born 18.12.1935 son of John [Jack] & Freda of Oak House. Started Grewelthorpe school 21.5.1947. left for Ripon Modern school 18.7.1947. WILLIAM THOMPSON. Born C. 1761. Buried 9.3.1838. Lived Biggin Grange. WILLIAM THOMPSON. Born C.1787. Died 12.4.1864 in Ripon workhouse. Buried 15.4.1864 Mickley. WILLIAM THOMPSON. Born C 1860 Harlsey. Died June 1888 Bedale. Employed as a groom/coachman by Harry Rouse of Firby Hall, Bedale. He was married & had 2 children. He died of a broken blood vessel. WILLIAM THOMPSON. Born C. 1861 Ilton. Buried 6.1.1931 Grewelthorpe. M.I.Farmer at Bush Farm Grewelthorpe. Possibly son of Robert the gamewatcher and Mary. Husband of Elizabeth of West Aukland, Durham. They married C1887. Had 9 children. WILLIAM THOMPSON. Born 7.12.1903. Bap 31.3.1912 Grewelthorpe. Son of William & Elizabeth of Bush Farm. Started Grewelthorpe school 3.4.1911. Left 1917. Married ANNIE PEACOCK. of Laverton in 1931. See picture below. Wedding reported 15th May 1928. Ripon Gazette.Mr. THOMAS. THOMPSON. second son of Mr. & Mrs. T. Thompson of Bush Farm Grewelthorpe. married MISS AMY TIPLING. Third daughter of Mr. & Mrs J.Tipling of Kirkby Malzeard.Bridesmaid was youngest sister of the bride MISS GLADYS TIPLING. and the bestman was MR. J. THOMPSON. brother of the groom. Death Notice in Leeds Mercury 1930. THOMPSON.T-September 15, 1930, Grewelthorpe. aged 39 years. THOMAS the husband of Amy Eliza THOMPSON.—lnterment at St. James’s Church, Grewelthorpe, to-day (Thursday), at 2.30 p.m. 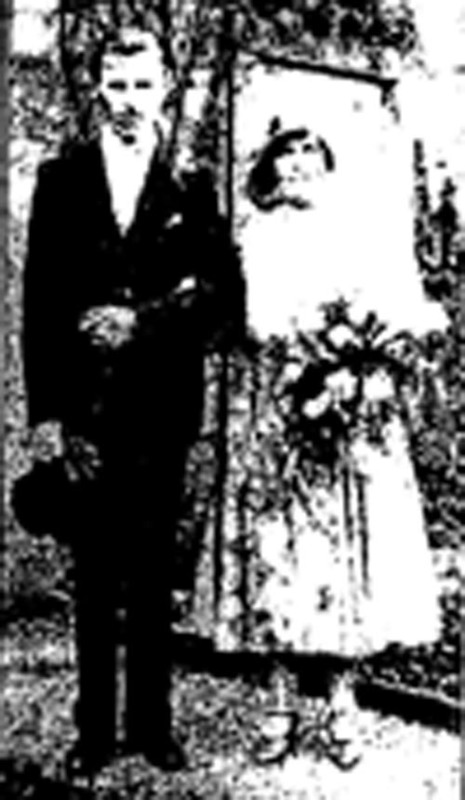 Wedding of William Thompson and Annie Peacock of Laverton in 1931. 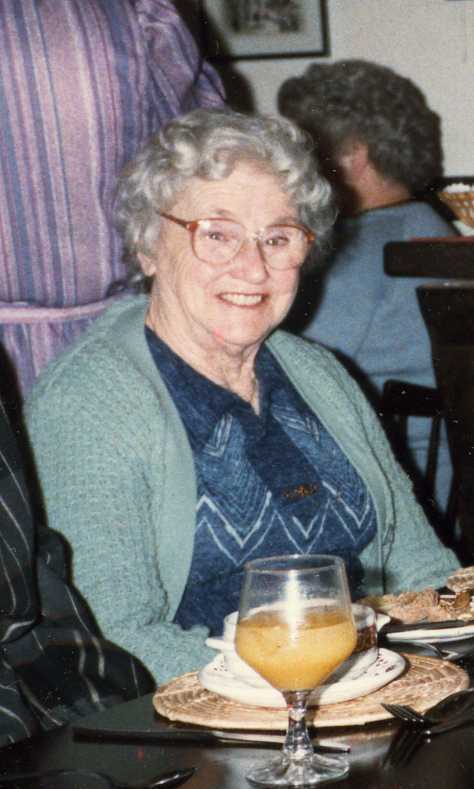 Freda Thompson [nee Ripley]. Wife of Jack Thompson of Oak House. 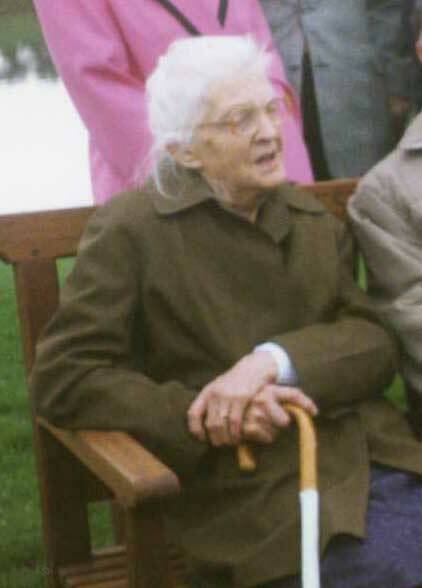 Mary Kitchen [nee Thompson] Photographed in 1992 aged 90.